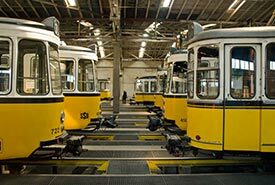 Retired trams face off in the museum's train shed. 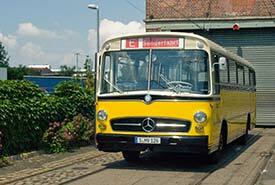 A two-tone streetcar has a color-coordinated ad banner for AEG washing machines. 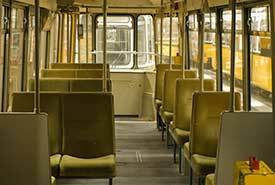 The meter-gauge trams were surprisingly spacious, with comfortable upholstered seats. 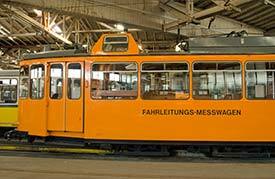 This "Messwagen" was used to check for track irregularities. 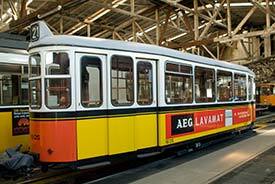 In the final days of Stuttgart's meter-gauge streetcar network, trams were painted with farewell messages. 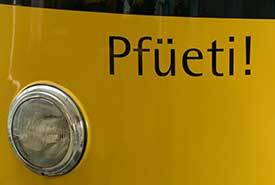 "Pfüeti" is a word in the local dialect that means "May God be with you."